No matter the circumstances, today BYU football has an opportunity to beat the Texas Longhorns, in Austin, and they need to take it. Texas has adopted the credo: Believe You’re Unbeatable, though I prefer the one on the right (h/t @ysguide). They both play well for the Cougars. Of the five TX losses last year, the one to BYU was the smallest margin. What gives? It’s a fair question. Of all the losses last year, why does the loss to the Cougars stick with the Longhorns enough to be the team’s motivational poster? It’s not so much that BYU beat Texas. BYU has enough of a reputation under Bronco Mendenhall that even Power 5 teams don’t see the team as a cupcake. What really got under their skin is the way we beat them. Jim pointed out that our win was by the smallest margin of all of Texas’ five losses. We won by 19 points. #25 Ole Miss won by 21, #12 Oklahoma State won by 25, #9 Baylor won by 20, and #9 Oregon (different weeks) won by 23 points. Notice a trend? All of Texas’ remaining losses were to ranked Power 5 teams. More than that, when you look at how BYU beat them, you can see why this game, in particular, stands out to the Longhorns. BYU thrashed the Texas defense with a record 550 rushing yards, with 259 coming from Taysom Hill alone (Jamaal Williams did throw in an additional 182, no biggie), on just 17 carries (yes, that’s 15+ yards per carry for the Cougar quarterback. In the end, BYU was simply not supposed to #BeatTexas, and when they beat them in such a headline-inducing way, it stung, and it still stings. Texas fired defensive coordinator Manny Diaz after the game, and of course (though obviously not as directly related) Mack Brown has been replaced by Charlie Strong. Charlie’s desire to use last year’s loss as motivation is a mistake. He may as well have used the poster on the right, because either one is a constant reminder of the doubt and yes, fear, which now surrounds this game for the Longhorns. Prior to the Texas offense being gutted by injury and suspension this week, I expected the Cougars to make a game of it and even win by a small margin at least. The game still has intrigue, as the Texas defense has remained in-tact, and of course, it’s still Texas, and BYU is not supposed to beat Texas, ever. 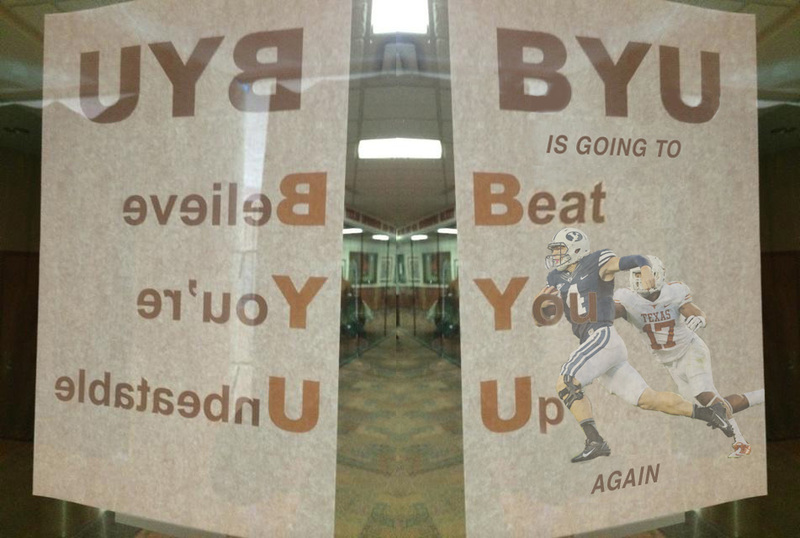 But BYU is in the head of every coach and every player on that squad, and when the Cougars win today, the slogan “Believe You’re Unbeatable” will be echoing in the minds of the Longhorns (and their opponents) for the rest of the season.